Tag line: "An Epic Entertainment Spectacular!" Knighted in 1947 for his contributions to stage and screen, Laurence Olivier was a performer of impeccable taste and charm, having conquered Shakespeare time and again with his portrayal of such legendary characters as Hamlet, King Richard III, Othello and Shylock just to name a few. But for a kid growing up in the '80s, Sir Laurence will always be Zeus, the ruler of Olympus and chief of the Greek Gods. It's a role he took on in 1981’s Clash of the Titans, a film also notable for its special effects, created by that master of stop-motion, Ray Harryhausen. 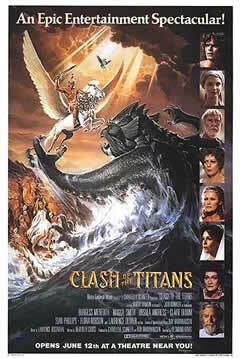 Clash of the Titans transports us to the days of Ancient Greece, a time when the Gods ruled the world from atop Mount Olympus. Perseus (Harry Hamlin), a noble warrior and the son of Zeus (Olivier), falls in love with Andromeda (Judi Bowker), a beautiful princess who is being tormented by her former love, Calibos (Neil McCarthy), a criminal physically deformed by Zeus as punishment for his crimes. Perseus defeats Calibos in battle, yet spares his life in exchange for the Princess’s freedom. But Calibos is also the son of an Olympian; the Goddess Thetis (Maggie Smith), and as revenge for her son's humiliation, she commands that Andromeda be sacrificed to the Kraken, a powerful sea monster, in 30 days time. Only the head of the Gorgon, Medusa, which can turn a man to stone with a single glance, can save Andromeda from a watery grave, and only a hero as mighty as Perseus can deliver it. Clash of the Titans features some of Harryhausen's most impressive creations, like the Kraken, which destroys the city of Argos in the film's opening scene, and the winged horse Pegasus, which assists Perseus on his adventures. As amazing as these creatures are, however, Harryhausen’s most stunning bit of animation has to be Medusa, the Gorgon with the granite-inducing stare. Having read Greek mythology as a kid, I was familiar with the legend of Medusa, and went into the film with a preconception of what she might look like. Harryhausen's Medusa encompassed everything I had imagined, and much more besides. In his hands, Medusa became a snake-like monster who slithered along the ground, had live asps for hair, and blood so lethal that one drop could burn a hole through solid metal. Being eleven years old when I first saw this movie, I found Harryhausen's depiction of Medusa both fascinating and unsettling. Love this movie. One of my all time favorites. I love this one too. I was lucky enough to see it on the big screen back in 1981, and I'll always remember the experience. At least I was born in time to catch one of Harryhausen's films! As a big fan of stop motion animation as a kid, I too enjoyed the film in theaters when it came out. I still haven't seen the recent re-make - do you know if it is any good? @Klaus: No, I haven't seen the remake, but I also haven't heard much good about it. Being such a fanboy of the original, I can't see myself checking it out anytime soon. Anyway, my aunt brought this film up a few weeks ago, then I saw a DVD with the original and remake for £5 in a local supermarket and we watched it last week. The magic is still there and it's a beautiful classical story of heroism, love, triumph over adversity and of course a little bit of tragedy. The reasons why I love reading classical Greek and Roman stories. and Perseus and Zeus are the things that interested me as a child and as a man. But the real star it the Owl, (how dare you not mention him in your review, ACTUALLY how dare you) I'm amazed how much life and emotion Ray Harryhausen managed to put into it. Medusa looks amazing as does the Krackon, but something about the owl and it's integration into the action is just amazing and never brings me out of the movie. I can't quite explain but I'm sure you know what I mean. Then we watched the remake, all I will say is, Good animation. Nearly forgot, the bit in the movie when Poseidon is releasing the Krackon is so funny, we cracked up laughing. Barl3y: I do apologize: the Owl should have been mentioned! In fact, one of the scenes in the remake that really pissed me off was when the soldier picked up a replica of the Owl and said "Do we bring this? ", getting a reply that he should just put it away. Not only did this show the director's distatse for the character; it also showed he had no idea how much fans of the films loved him. But then, the remake sucked in so many ways, to point this one scene out is kinda silly. I love this movie. I've got it on DVD. I'm a huge fan of Harryhausen. The movie is not without its flaws however. In the scene where the city is being flooded, a gust of wind blows the toga up of one of the extras, revealing what appears to be a vintage pair of black Addidas shorts. At least it didn't show his Kraken! I remember watching this on tv when I was growing up and thought it was horrible, but as an (alleged) adult, I've seen it a few times and it's better then I remember. It's also A LOT better then the remake. BTW, the movie the Great Wall is now out on DVD. I suggest that you watch it because it's very good.